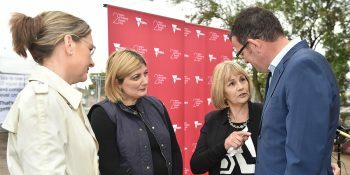 The Andrews Labor Government is putting people first and removing dangerous level crossings across Melbourne, including at Main Road in St Albans where 16 people have tragically lost their lives. NATALIE SULEYMAN: Good afternoon to you all. My name is Natalie Suleyman and I’m the local State Member for St Albans. I’m here today at Main Road level crossing. What a fantastic investment we’ve seen from the Andrews Labor Government delivering on our election commitment.. The Andrews Labor Government’s work to remove 50 dangerous and congested level crossings is reducing congestion and making communities safer – and it has already created thousands of new jobs.